Well, I did it! At the beginning of February, for A Lovely Year of Finishes, I said I wanted to finish Modern Crosses this month and I had to stay up a little late this week, but it's done. There are numerous different fabrics in there, as well as some Kona Snow. 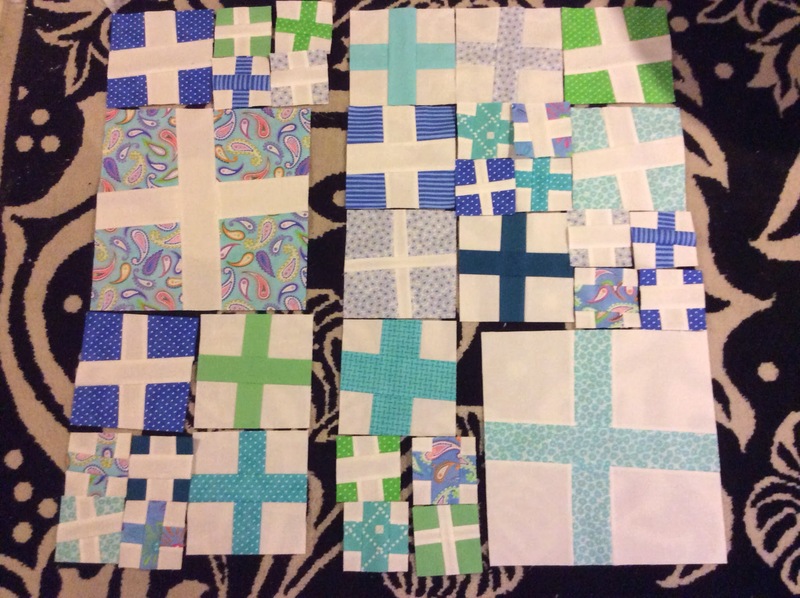 The blocks finish in three different sizes: 3", 6" and 12". 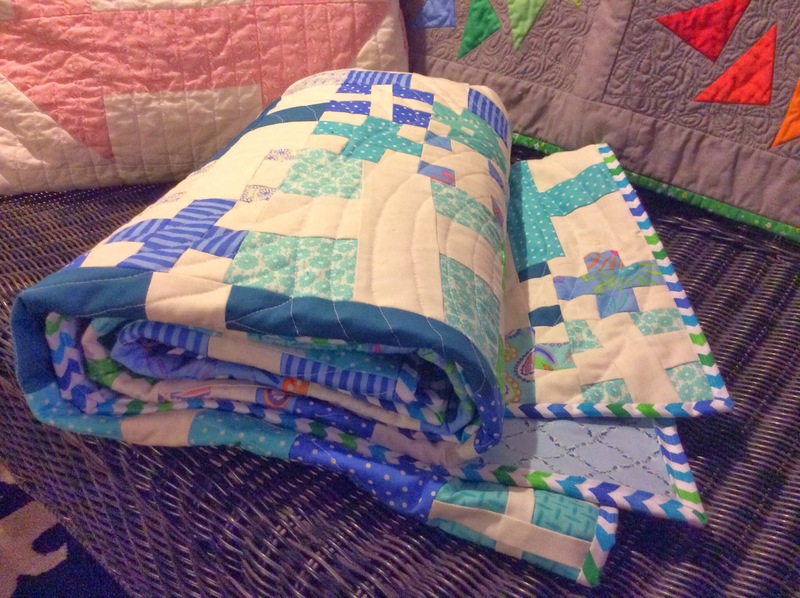 The quilt was designed by Elizabeth Hartman who blogs at Oh, Fransson! Elizabeth also teaches this particular quilt pattern in her Craftsy class (which I really, really like!). 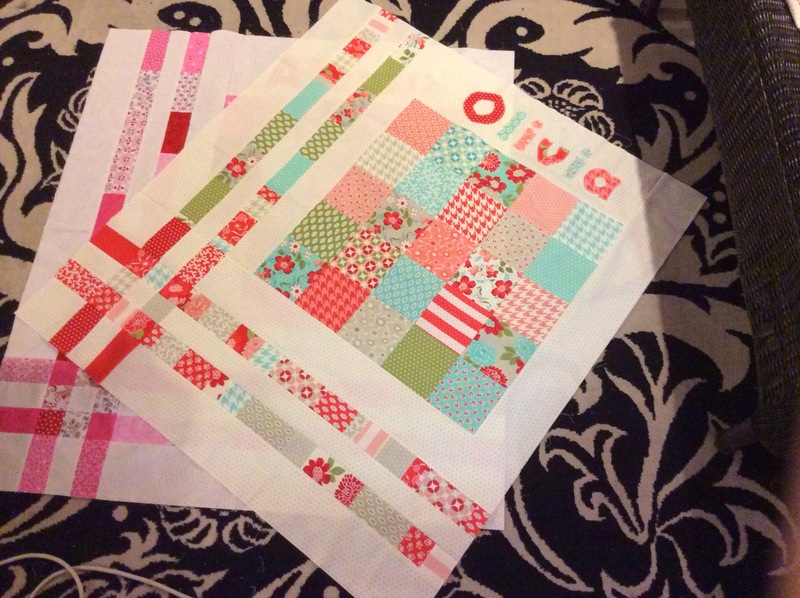 The backing is a more traditional print which I have had in my stash forever. I also used a few of the leftover blocks to piece the label right into the backing. The binding is a really cool chevron print. I quilted spirals in different sizes. 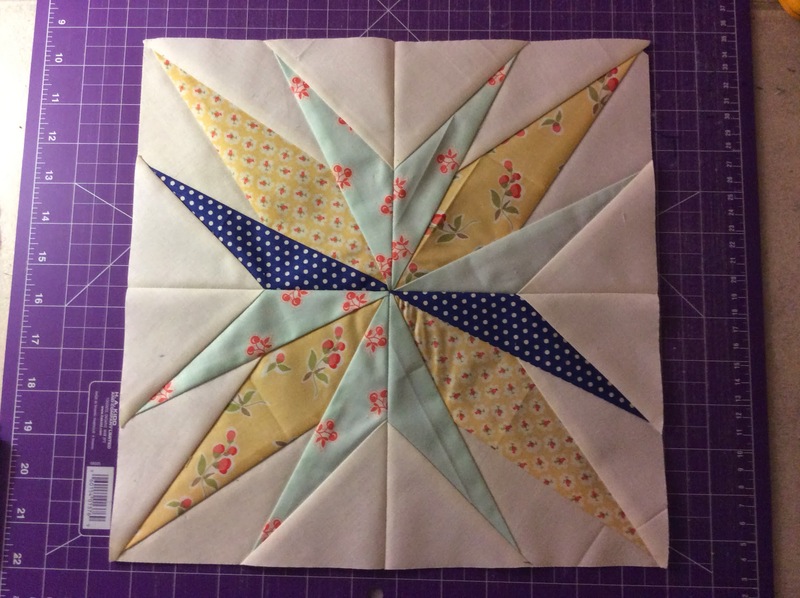 I like the curves of the spirals against the sharp lines and angles of the piecing. And the quilting was really quick and easy with my FMQ foot. 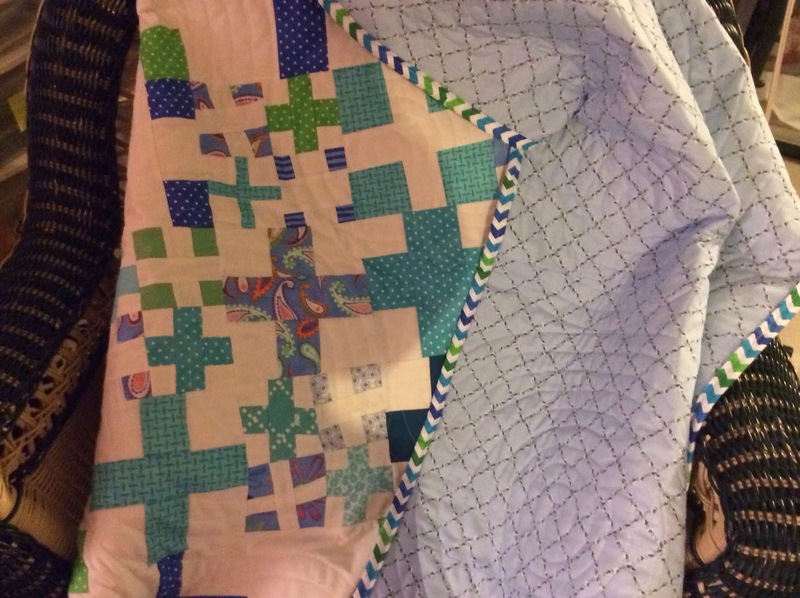 They are not perfect, but they are good enough and they give the quilt a really nice texture. Modern Crosses measures 60" square and will most likely live on the living room couch, just waiting for someone to snuggle with while watching TV. 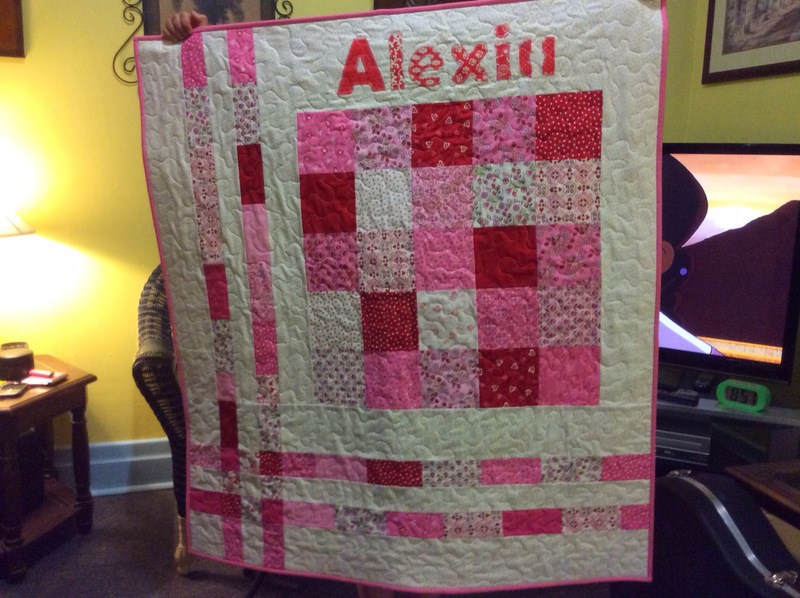 Linking up at Crazy Mom Quilts, My Quilt Infatuation, Mila and Cuatro for TGIFF and at ALYOF. I plan on getting the second one done when I get back from the cottage Sunday night. I'm really sorry about the crap photo, but I won't be able to get a good picture until the weekend and I really wanted to tell you about this finish. 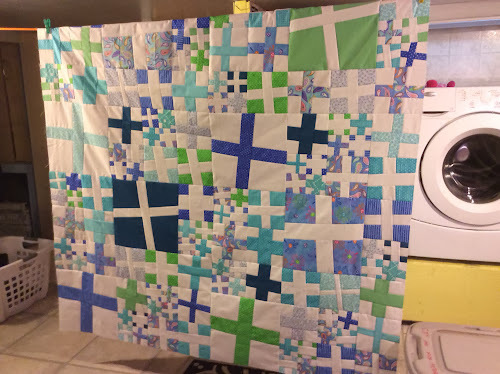 As I mentioned in a previous post, I used a MBS tutorial for this baby quilt and it was super quick and easy to put together. I went with a Deb Strain charm pack (Always and Forever) and a very small print for the background (can't remember the collection unfortunately). The binding is Kona Bubblegum. The back is a super soft flannel by Cloud 9. It is absolutely divine! It measures 40" square before washing. My sweetie and I spoke to the twins' mother tonight to see when we could visit and we found out baby Olivia came home today, but Alexia is still struggling... So if you are the praying type, please say a little prayer tonight for baby Alexia. I know their mother is really anxious to have them both home. I'll be back on Sunday with Olivia's finished quilt! For WIP Wednesday this week, I have 3 finished tops to share. First up, I appliqued the name on the Vintage Modern baby quilt for twin baby Olivia. I absolutely love this little quilt and can't wait to have it all finished. 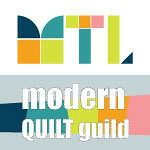 I ordered a super soft flannel for the backing for both quilts and will be using Kona Bubblegum for the binding. 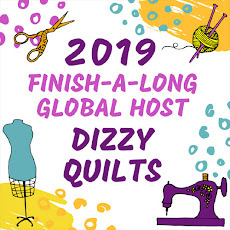 I can't wait to see them all quilted and done. And finally, I finished piecing my Modern Crosses top. This quilt top is one of my all-time favourites. I love the colours and the pattern is so much fun. When I got home from work today, I pieced the back and I hope to sandwich and start quilting it tomorrow night after work. With any luck, my sweetie will be able to have his Saturday afternoon nap snuggled under this quilt this weekend. What about you? Do you have lots of WIPs? Head over to Lee's and link up! My sweetie's ex-wife gave birth to twin girls about a week ago. I cannot imagine giving birth to twins at 40, but I am also super happy for her and her new husband. The twins were born at 33 weeks and they are tiny and will likely stay in the hospital for a few more weeks. 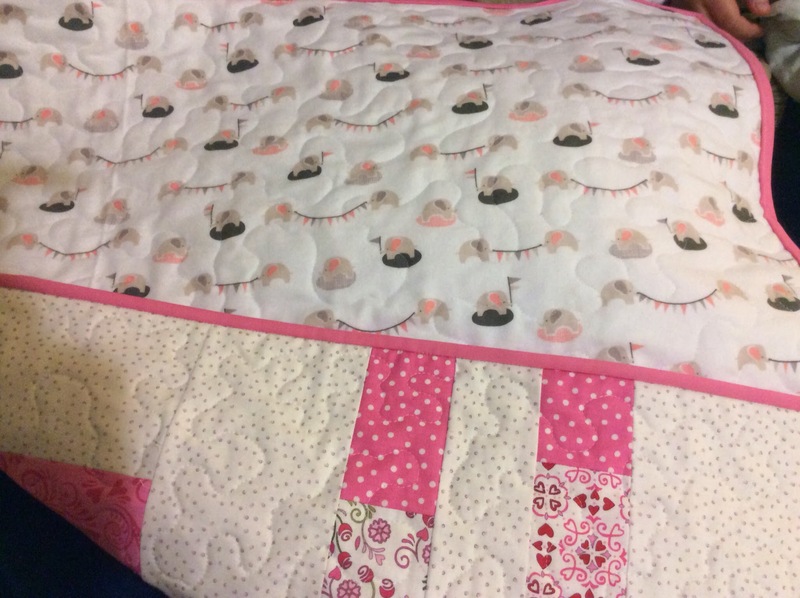 When I saw the pictures of these beautiful little girls wrapped in those ugly hospital blankets, I knew I had to make them little quilts for when they are taken out of the incubators. 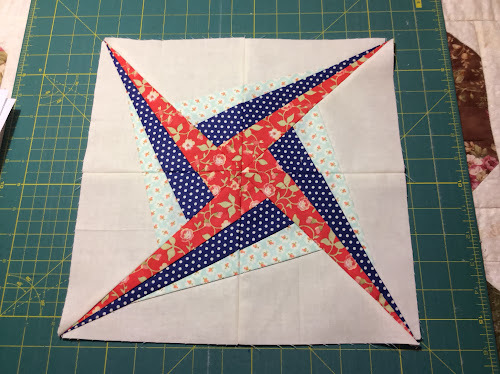 So I searched for quick charm square friendly baby quilt patterns and immediately found one I loved on the Moda Bakeshop. For this first quilt, I used a charm pack of Bonnie and Camille's Vintage Modern. I love the colours... So sweet and happy and girly! 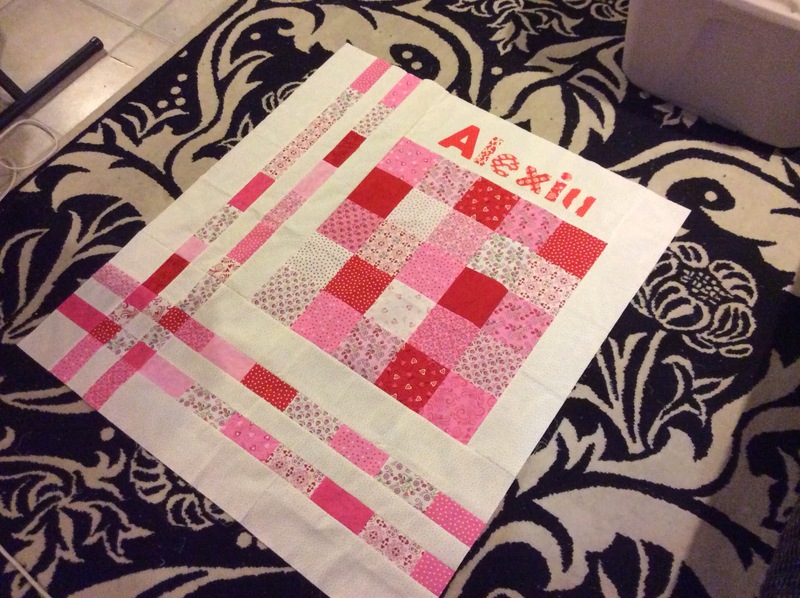 I plan on adding the name at the top and will quilt it with a soft all-over meander. I love the texture and it's super fast. 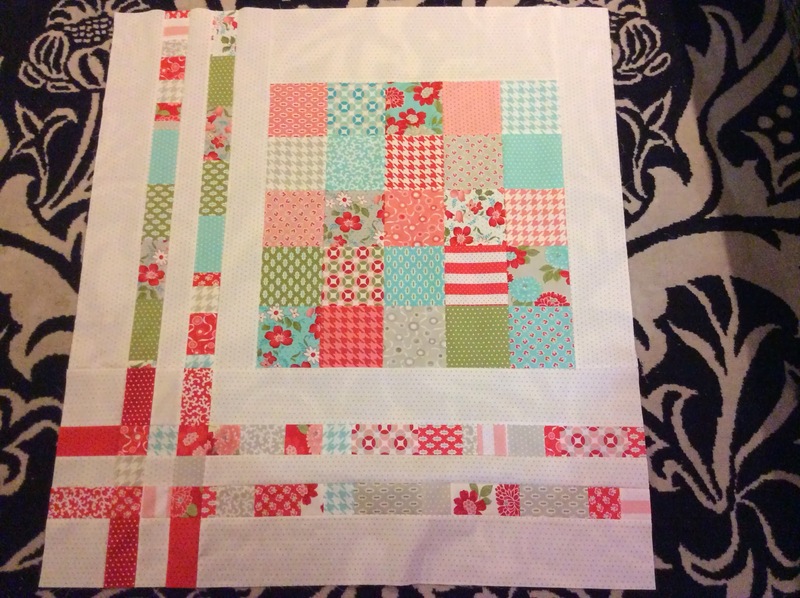 Then I need to find another quick pattern for the other twin's quilt! And what are you working on this week? 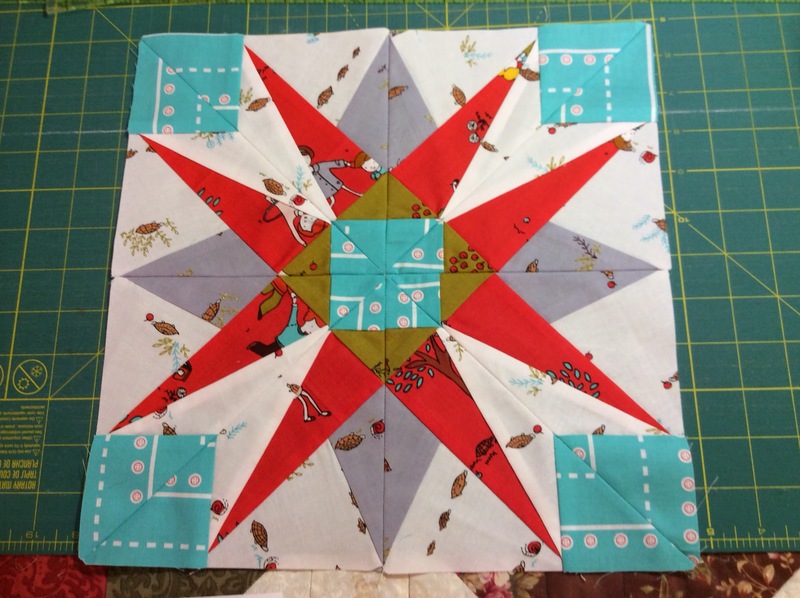 Will be linking up at Lee's for WIP Wednesday. You might remember that I signed up for Don't Call Me Betsy's Lucky Stars BOM a little while ago. Paper-piecing is a technique I really want to get better at because you can achieve such amazing results with it. 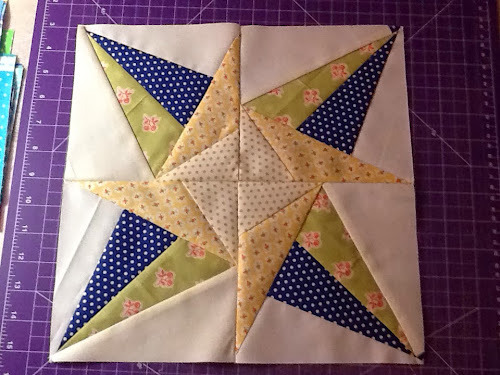 When I packed for the weekend at the cottage this week, I decided to pack the materials I would need to make a couple of paper-pieced stars... The January and February 2014 blocks to be exact. 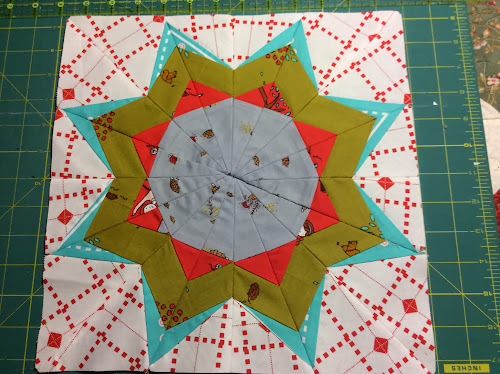 For the 2014 stars, I decided to use the Little Apples fat quarter bundle I purchased a long time ago. I wasn't sure the bigger prints would work with paper-piecing, but I went ahead anyways. I had a few problems getting the seams to lie flat because there is A LOT of bulk where those seams meet, especially in the middle. So the results aren't as nice as I had hoped. In addition to the bulky seams, all those bias edges really stretched on me so there is a lot of wavy stuff going on here. Lesson learned with this block: buy startch! I am a lot happier with this one. However, the seams don't all match. This could be the bias edges again so this might be resolved in the future by using starch when I press the finished units. I haven't decided yet if these stars will ever get sewn together into a quilt, but they are amazing practice. Do you paper-piece? If yes, do you have any tips for me? I would love to read them so leave them in the comments! 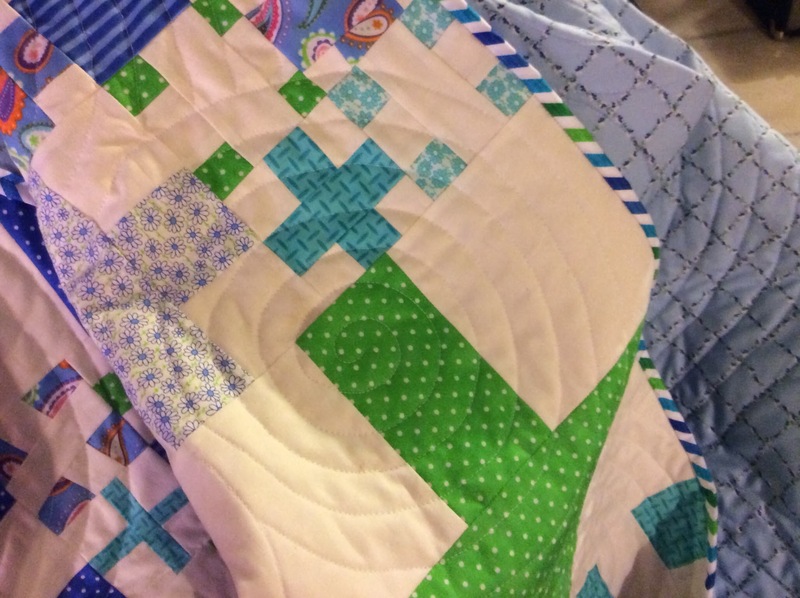 I haven't done much quilting since I finished Heather's baby quilt last week. I spent most of the weekend relaxing, watching TV and spending time with family. 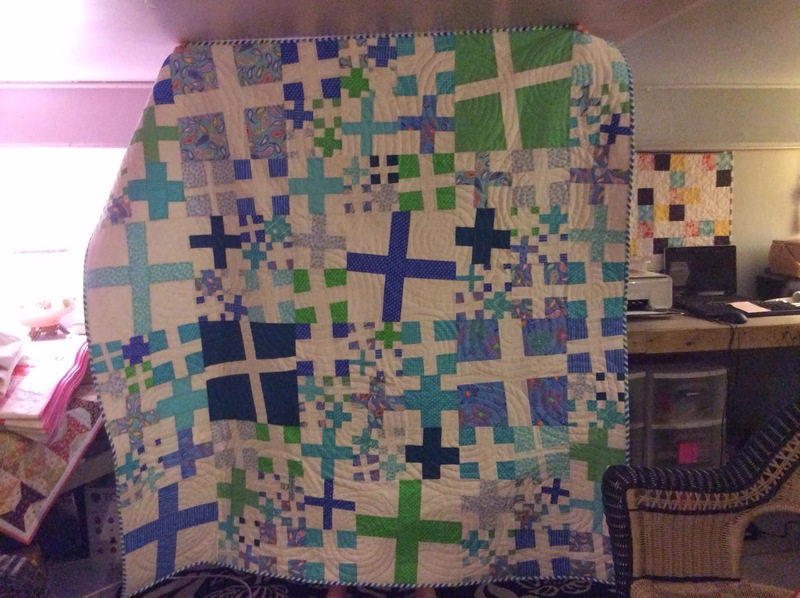 But last night, I got back to my Modern Crosses quilt. 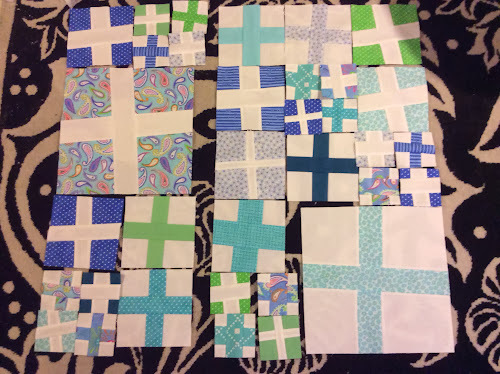 You might remember I started piecing these really fun blocks a couple of months ago, but then had to put them aside as I was sewing for Christmas and making baby quilts. 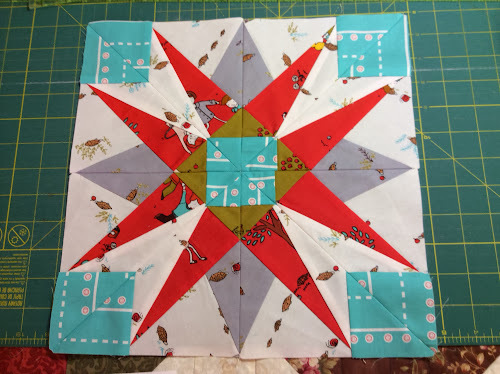 If you took Elizabeth Hartman's Craftsy class, you might remember this quilt, except I decided to make the lap size version. And because these blocks have been hanging around my sewing room for long enough now, I am making this quilt my goal for February over at ALYOF.